Sculpture, Architecture, Facade, Dome; Design History. the greatest architects in Italy. For more religious architecture, see: Christian Art (c.150-2000). The Basilica Papale di San Pietro in the Vatican City, commonly known as Saint Peter's Basilica, is the most famous Roman Catholic church in the world and one of the holiest sites in Christendom, dating back to Roman architecture of the early Christian art period. The basilica, now the Pope's principal church, was built according to tradition above the burial site of St. Peter, one of the twelve disciples of Jesus and the first Bishop of Rome, who was martyred in the year 64 CE. To maintain this tradition, Popes are now buried within the basilica. Designed as a replacement for the old Constantinian church (where, for instance, King Charlemagne had been crowned Holy Roman Emperor on Christmas Day 800) which had been erected around 320 CE, construction of the present building was begun in 1506 (under Pope Julius II) and completed in 1626 (under Pope Urban VIII). Admired for its Renaissance sculpture as well as its fusion of Renaissance and Baroque architecture, the design, construction and decoration of Saint Peter's involved the greatest Old Masters of the day, including Alberti, Raphael, Bramante, Michelangelo, and Bernini. Note that it is called a papal basilica rather than a cathedral, since it is not the seat of a bishop: the Arch Basilica of St. John Lateran is actually the cathedral church of Rome. The latter functions as the principal church for worshippers who live in Rome, whereas the former serves as the focal point for all pilgrims who come to Rome, as well as locals. From the ninth century onwards, the Christian Church was inextricably linked with the fine arts of architecture (for basilicas, cathedrals, churches, abbeys like Cluny), sculpture (both reliefs and statues) and painting (altarpiece panels as well as monumental works), for which it became the greatest sponsor and patron across Europe. It also commissioned many types of decorative art, including stained glass (notably in Gothic cathedrals), and tapestry art, as well as a huge range of mural painting (Sistine Chapel) illuminated manuscripts and miniature painting. In south-eastern Europe, in particular, it commissioned numerous items of mosaic art and a wealth of icon-painting. All these beautiful designs and objects of religious art were created in order to inspire religious congregations with the Christian message. In fact, at certain times, such as during the mid-16th century Counter-Reformation, sculptors and painters were given detailed instructions about how the precise features of a New Testament story should be presented. So it is no surprise that Saint Peter's Basilica itself - the world centre of the Roman Church - is lavishly endowed with many different types of art. Built out of travertine stone, Saint Peter's is 452 feet high, 730 feet in length, and 500 feet in width, with an interior length of just over 693 feet (roughly 211 metres). Covering an area of 2.3 hectares (5.7 acres or about 50,000 square feet), and large enough for 60,000 people, it used to be the largest Christian church in the world, but in 1989 it was exceeded in size by the church in Yamoussoukro, Cote d'Ivoire. Pilgrims entering the basilica are monitored by church officials and members of The Swiss Guard. Inside, the basilica is cruciform in shape, with an elongated nave in the form of a Latin cross. The nave is framed by wide aisles giving access to a number of chapels. These include: the Chapel of the Presentation of the Virgin, the Clementine Chapel, the Chapel of the Madonna of Colonna, the Gregorian Chapel, the Chapel of the Pieta and several other altars. In addition, beneath the high altar, is the Chapel of the Confession. The interior of Saint Peter's contains a number of priceless treasures in marble and bronze by the greatest Renaissance sculptors - works such as Pieta (1500) by Michelangelo - as well as Baroque sculpture - such as the baldachin or ceremonial canopy over the main altar, and the traditional Chair of St Peter (Cathedra Petri), both designed by Bernini - and Neoclassical sculpture (such as the marble statue of Pope Pius VI) by Europe's greatest neoclassical sculptors like the Italian genius Antonio Canova (1757-1822). It also contains numerous papal tombs ornamented with marble statues and reliefs - such as the Tomb of Pope Leo XI (1634-44) by Alessandro Algardi (1598-1654) - as well as mosaics and precious metalwork. Ironically, the huge and aggressive fund-raising campaign required to pay for the cost of the basilica and its contents (46 million ducats), led to protest across Europe and became an important factor in triggering the Reformation and the birth of Protestantism. Saint Peter's is approached via St. Peter's Square, an elliptical forecourt encircled by a Doric colonnade, derived from Greek architecture. It ends at the facade of Saint Peter's which is 376 feet wide and 150 feet high. Designed by Carlo Maderno, the facade features a giant order of Corinthian columns (each 90 feet high) and is topped by thirteen statues - Christ flanked by eleven of the Apostles (excluding Peter) plus John the Baptist. At ground level it is approached by steps guarded by two 18-feet high statues of Saints Peter and Paul. The Basilica of St. Peter is one of four Major Basilicas of Rome, the others being Santa Maria Maggiore, St. Paul and St. John Lateran, but it is the dome of Saint Peter's - the tallest dome in the world - that dominates the skyline of Rome. Designed largely by Michelangelo, and built during the short but active papacy of Sixtus V (15851590) by Michelangelo's pupil Giacomo della Porta, the dome rests on four pendentives and massive piers, each 60 feet thick. It was Michelangelo who increased the size and strength of the load-bearing structure without destroying the central unity of Bramante's original design. Immediate rivals of St Peter's dome include Florence Cathedral of the Early Renaissance, designed by Filippo Brunelleschi and completed in 1434 - for details, see Florence Cathedral, Brunelleschi and the Renaissance (1420-36); Constantinople's Hagia Sophia church, completed in 537; and the dome designed by Christopher Wren for St Paul's Cathedral, finished in 1710. St Peter's Basilica is maintained by the Sampietrini, a specialist group of workers who continually scale and inspect the building's surfaces. Some 100 tombs are to be found within St. Peter's Basilica, including a number located in the Vatican grotto, underneath the Basilica. They contain 91 popes, the Holy Roman Emperor Otto II, St. Ignatius of Antioch and Pope John Paul II. In a subterranean crypt, directly below the dome and the main altar, is the tomb of St. Peter himself. Positioned in niches set into the four piers supporting the dome are a number of statues associated with the holy relics of the basilica. They include: St. Helena holding the True Cross, by Andrea Bolgi; St. Longinus holding the spear that pierced the side of Jesus, by Bernini (1639); St. Veronica holding her veil with the image of Jesus' face, by Francesco Mochi, and St. Andrew with the St. Andrew's Cross, by Francois Duquesnoy. The pope who first mooted the idea of a replacement for the old Constantinian basilica was Pope Nicholas V (144755), who commissioned Leon Battista Alberti (1404-72) and Bernardo Rossellino (1409-64) to produce a plan for a new structure. Pope Sixtus IV (1471-84) founded new churches, including the Sistine Chapel, widened streets, and helped to transform Rome into a Renaissance city, but left the basilica alone. It wasn't until his nephew Pope Julius II took over as pontiff in 1503 that things began to move. Julius decided to demolish the old basilica and replace it with a new one to house his large tomb. A long succession of popes, architects, designers and stone masons eventually saw the project through to completion in 1626. Active pontiffs included: Leo X (15131521), Clement VII (15231534), Paul III (15341549), Sixtus V (15851590), Gregory XIV (1590-1), Clement VIII (15921605), Paul V (16051621), and Urban VIII (16231644), while among the most famous architects (Capomaestro) involved in its design, were Donato Bramante (1444-1514), Raphael (1483-1520), Giuliano da Sangallo, Baldessare Peruzzi, Antonio da Sangallo the Younger, Michelangelo (1475-1564), Giacomo della Porta, Carlo Maderno (1556-1629) (assisted by Francesco Borromini 1599-1667) and Giovanni Bernini (1598-1680). The lengthy and intermittent progress of its construction illustrates the changing course of High Renaissance art towards a break from strict, antique precedent to the freer eclectic tendencies of Mannerism and ultimately the Baroque. The artistry, architectural grandeur and sheer mass of St Peter's Basilica reaffirmed the status of Rome as the spiritual, if not temporal, home of Christianity. Who wouldn't be weak at the knees to be among a crowd of anything up to 100,000 hushed and expectant people tightly packed in St Peter's Square waiting for the Pope to raise his arms in the blessing urbi et orbi, dedicated to the city (Rome) and the world? 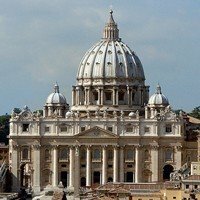 It is to Rome that people flock for this unique experience - the characteristic gesture with which the Roman Catholic Church presents itself to the world. They congregate in this square (dimensions: 787 feet x 1,115 feet; 240m x 340m) whose vast expanse so impressively symbolizes the universal embrace of the Church. It was Bernini, one of the most talented Baroque architects and sculptors, who designed the layout of St Peter's Square in the manner of a theatre, with the square as the auditorium and the facade of the basilica as the stage - all in keeping with the desire to make St Peter's Basilica a textbook example of Catholic Counter-Reformation Art (c.1560-1700). Basing his ideas on the architecture of classical antiquity, he drew up an elliptical space surrounded by fourfold rows of columns adorned with the figures of 96 saints, which was to become the most famous colonnade in the world. In the early 19th century, the romantic poet Wilhelm Muller wrote that the tall colonnade encircled St Peter's Square at night "as if with shimmering arms". Bernini himself envisaged the colonnade as representing the arms of God enfolding the faithful, and the architecture of the square has received praise throughout the centuries for the elegance of its sublime proportions. A smaller square, the Piazza Retta adjoins the great square. Its enclosed sides lend an air of greater intimacy. In the centre of St Peter's square today is an obelisk (132 feet high) brought from Egypt to Rome in 37 CE during the reign of Caligula. Originally it was located on the hill of the Vatican in Nero's Circus - the site of St Peter's martyrdom - when he was crucified. It was brought to its present location in 1586, and is revered as a "witness" to Peter's death. Its move must have been an astounding spectacle since it took 140 horses and 900 labourers to move the 385 ton monolith to its new site, using a complex rope winch system.  For more about Renaissance/Baroque architecture, see: Homepage.